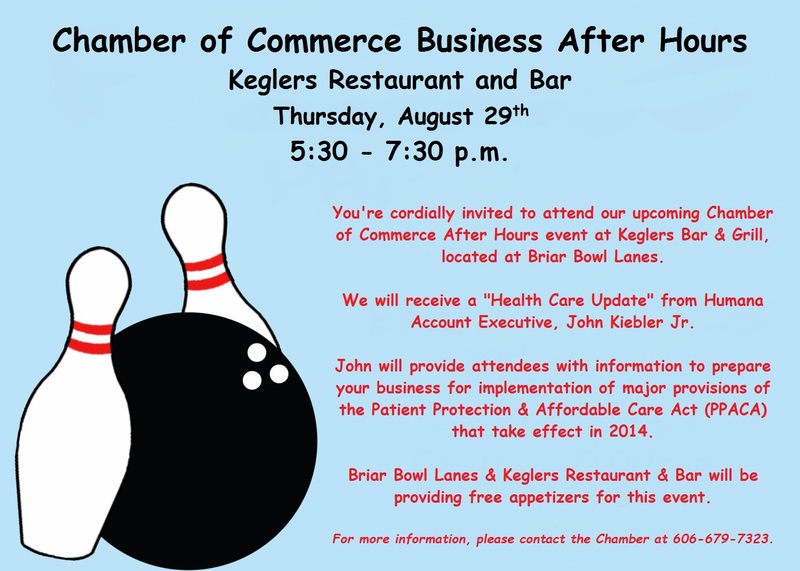 You’re cordially invited to attend our upcoming Chamber of Commerce After Hours event at Keglers Bar & Grill, located at Briar Bowl Lanes. We will receive a “Health Care Update” from Humana Account Executive, John Kiebler Jr.
John will provide attendees with information to prepare your business for implementation of major provisions of the Patient Protection & Affordable Care Act (PPACA) that take effect in 2014. Briar Bowl Lanes & Keglers Restaurant & Bar will be providing free appetizers for this event. For more information, please contact the Chamber at 606-679-7323.